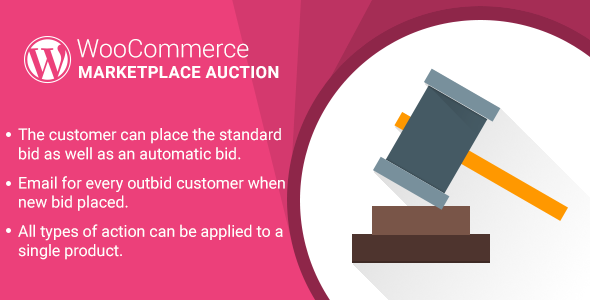 WordPress WooCommerce Marketplace Auction plugin will enable the auction feature in the marketplace. Using which sellers and the admin can add auction in their products and the buyer can bid on their products. By using this plugin, the admin, and the sellers can add four types of auctions which are standard, incremental, automatic, and reserve auction. Note : It will work for Simple, Variable and Virtual product type only. The admin has the option to show current bid. "Initial release v 1.0.0", "Current release v 2.1.1"
Fixed : Fixed bid and product price issue. Fixed : Restriction to add auction product in cart. Fixed : Fixed notice on add auction page. Fixed : Added check for date format in add auction and bid process script. Update : Updated as per WooCommerce 3.2.x. Update : Updated to make compatible with latest Marketplace.